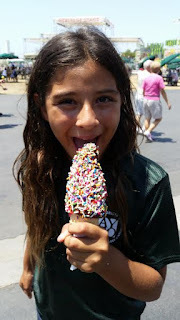 Tradition is OC Fair - It's not summer in the OC with out a visit (or 5 visits) to the Orange County Fair! 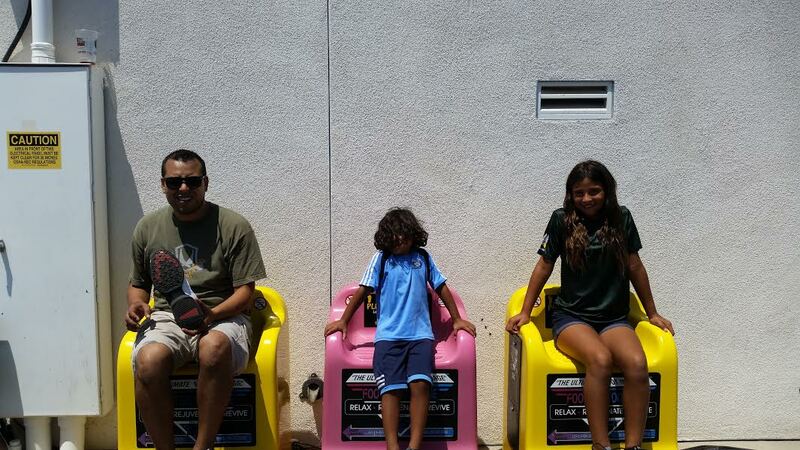 We had so much fun at the OC Fair last weekend! It was a blast to see my kids run around this year both able to ride most of the big kid rides. It was so nice to walk through all of the arts and crafts and visit the vendor halls so see what everyone was offering. For the first time we ran into the Conjurer - that was fun. It's a life size real life fortune teller and totally entertaining for all ages. To food is always a plenty at the OC Fair. What is your favorite and what do you want to try most his year? We love the Fish & Chips and of course the funner cake but another family favorite is the bbq corn. So good. I would like to try one of everything one year hehe! The Rides... Now that the kids can both ride the bigger rides we had so much fun seeing what we all wanted to ride together! Rest your feet a bit on the same foot massagers that were there when I was a kid.. now my kids have the fun too! The fair is in it's 3rd week now... runs through August 14th. We went back today with my daughters club soccer team for the flag ceremony and rode rides and played games for $2 each. So much cheaper than peak times and less crowded. Here are the updates for week 3 of the OC Fair through this weekend. Updates From the OC FAIR 3rd Week! The 2016 OC Fair is rolling out its third week celebrating all things Fair. Guests have plenty of opportunities to “Get Your Fair Face On!” with thrilling rides, deep-fried and bacon-wrapped delicacies and nightly entertainment. The Fair is closed Monday and Tuesday. The majestic Budweiser Clydesdales return to the OC Fair for a weeklong (August 3-7) exhibit in the Livestock Area with daily hitch preparation demonstrations at 4 p.m. and a parade through the Fair at 5 p.m.
Additionally, the Oasis Camel Dairy returns with their unique alternative to cow’s milk with all-day exhibit and daily milking demonstrations available in the Livestock Area from August 3-14. Seniors Day: Guests 60 and older receive $2 off Senior admission and free Ferris wheel and merry-go-round rides all day. $2 Rides & $2 Games: Every ride and every game in both the adult carnival and children’s carnival is only $2 each until 4 p.m.
OC Fair Express: Receive a coupon for $3 general admission when using a special route directly to the Fair from 9 different OCTA transit locations ($2 for one-way and $4 for round-trip). Noon – Midnight. Visit ocfairexpress.com for transit locations and times. Community Flag Salute: Representatives from Buena Park, Laguna Hills and Westminster will lead Fairgoers in singing the National Anthem at 12:30 p.m. at The Hangar and residents can enjoy a $2 discount on admission with a Fair coupon available at their local city halls or libraries. Dip Into the Fun: Fairgoers can showcase their best kitchen skills in the culinary competition for best dip judged live in the OC Promenade at 1 p.m. Online registration deadline is Wednesday, August 3. 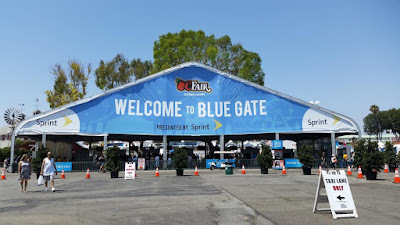 OC Fair Express: Receive a coupon for $3 general admission when using a special route directly to the Fair from 9 different OCTA transit locations ($2 for one-way and $4 for round-trip). 10 a.m. -Midnight. Visit ocfairexpress.com for transit locations and times. Plein Air Festival at the Fair Live Contest: Painters will take over the Fair as they capture the scenes on canvas as part of live art. Registration deadline is Wednesday, August 3. Contest is 8 a.m.-4 p.m.
OC Fair 5K Fun Run: A 5K only the OC Fair could host with detours to fun like rides, photo opps and unique sights. 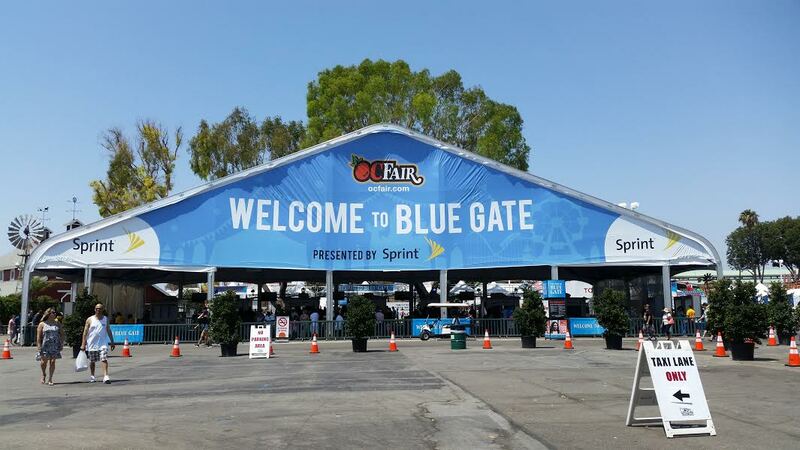 Starts at Blue Gate at 8 a.m.
“Show Us Your Fair Face!” A multi-media presentation shown nightly featuring a fun five minute video topped off with a pyrotechnics finale. Fairgoers can participate in this exciting interactive mosaic by submitting a photo of their “Fair Face” at ocfair.com/ocfairface. Fair Read & Ride Book Report Form (available online at ocfair.com/readandride) will receive three free carnival rides. Free Exhibits and Events: Free community entertainment all day, culinary displays in the OC Promenade, Peking Acrobats and Comedy Hypnotist Mark Yuzuik at Heritage Stage, Russell Brothers Family Fun Circus, Dragon Knights, All-Alaskan Racing Pigs, nightly Karaoke Rockstarz, educational exhibits and contests, Explorium: Destination Kids, garden exhibits in the Centennial Farm and more.